In 1942, as the World War Two Battle of the Atlantic was raging, the British Royal Navy needed a way to keep a watch out for German airplanes or submarines attempting to lay minefields in the mouth of the Thames Estuary. So it built four “Maunsell Naval Sea Forts”, consisting of a pair of pontoons supporting two concrete towers and an iron platform slung between them. The forts were towed out into the Thames Estuary, and the pontoons were flooded to rest them on the seafloor, with the towers and platform above the surface. The hollow towers had seven floors each, with rooms for crew, equipment and storage. Each fort was manned by 150-300 Royal Navy personnel, who manned the radar sensors, two 3.75-inch coastal guns, and two 40mm anti-aircraft cannon. In addition, the British Army built three smaller Maunsell Forts, to be used as air-raid lookout posts and platforms for anti-aircraft guns. After the war, most of the forts were abandoned. But one, named “Fort Roughs”, was occupied by a Royal Navy radar post until 1956, when it too was abandoned. Fort Roughs sat empty and crumbling until 1965, when a group of “pirate radio” operators, who were running an illegal unlicensed radio station from ships outside the UK’s three-mile territorial waters, anchored themselves next to the platform to use it as a base to land their supply helicopters. The Fort was located six miles from shore, and was outside the three-mile territorial limit. In 1967, another pirate radio operator named Roy Bates was arrested and fined for operating the illegal transmitter “Radio Essex” from a barge anchored near another of the offshore forts. It was during his legal proceedings that Bates first thought about the old Fort Roughs out in the Thames Estuary. His lawyer told him that he thought the argument could be made that, being in what was technically international waters, the British Government would have no legal jurisdiction there. That was all Bates needed to hear: he packed up his radio equipment, put it aboard a boat, landed on the Fort Roughs platform, and after a couple of fistfights, ejected the pirate station that was already there. Bates then formally declared his independence from Britain, named his platform the “Principality of Sealand”, and wrote a Constitution naming himself as the Royal Prince. At first, the British Government paid no attention to this eccentricity (though it did tear down the other old Maunsell Fort that was located in international waters, to prevent a repeat). Bates never got to set up his pirate radio station–the UK passed a law making it illegal to beam any radio station into the country even from outside the three-mile limit. But things escalated a few months later in 1968, when a group of British technicians took a boat out to repair a navigational buoy that was floating near the platform. As they approached, Bates’ son Michael grabbed a rifle and fired several “warning shots” over their heads to keep them out of “the territorial waters of Sealand”. This time, the Queen’s Government was not amused, and charges were filed against Michael. But, in a decision that startled the prosecutors, the court ruled that since the incident had occurred outside of the three-mile territorial limit, the British Government had no legal jurisdiction there. “This is a swash buckling incident perhaps more akin to the time of Sir Francis Drake,” the judge declared, “but it is my judgment that the UK courts have no jurisdiction.” The charges were dropped. To Bates, it was as if the British Government had legally recognized the sovereignty of Sealand. By 1975, Sealand had a flag, a national anthem, a national motto (E Mare Libertas, “From the Sea, Freedom”) and was issuing its own currency and passports. 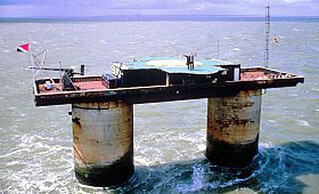 Then in 1978, ten years after the “1968 War”, Sealand was the scene of another international dispute. A German lawyer named Alexander Achenbach, who held a passport from Sealand and had purchased the title of “Prime Minister”, hired some German and Dutch mercenaries and, while “Prince Roy” was away in England, invaded Sealand by boat, helicopter, and jet ski. After several hours of bloodless (and gunless) fighting, Michael Bates was captured and sent on a boat to Holland, where he was dumped on shore. He promptly recruited some mercenaries of his own (including a helicopter pilot who had worked on some of the James Bond movies), and returned, with Michael Bates himself rappelling from a chopper to the fort’s platform and firing a single blast from a shotgun into the air. The occupying mercenary forces surrendered, and Bates locked them (and Achenbach) in a room. When the German and Dutch Governments demanded the release of their citizens, Prince Bates replied that they had been charged with treason against Sealand, and would not be released unless they paid a fine of 75,000 deutschmarks. The German Government in turn appealed to the British Government for help–and was told that the UK had no jurisdiction there. After several days, the German Government sent an official diplomat from London to Sealand to negotiate the release of the captives. Bates promptly declared that this constituted German recognition of the sovereignty of Sealand. Achenbach, meanwhile, returned to Germany and set up a “Sealand Rebel Government-in-Exile”, where he continued to claim the legitimate leadership of Sealand. Since the Rebellion of 1978, Sealand has been quiet. In 1982, during the Falklands War, Bates claimed that the Argentine Government had approached him to buy Sealand, but he turned them down. In 1987, the extent of national territorial waters was extended by international law from 3 miles to 12 miles, bringing Sealand completely into British territory. Plans were even drawn up for the British military to take the fort by force, but were shelved when someone pointed out what a complete PR disaster it would be. Since 1978, the Royal Government of Sealand has made its living by selling passports, postage stamps, and noble titles in the House of Bates. In 2000, the data storage company HavenCo Ltd leased the platform as a secure place to put its servers. In 2007 the family put the whole “country” up for sale, for $900 million, but got no takers. On October 9, 2012, His Royal Highness, the Prince Roy Bates, died from Alzheimer’s. His son, already serving as “Regent”, took over the Principality. So, does Sealand have any claim to real sovereignty? Nope. Not only does it fall within the 12-mile territorial limit, but international treaties are specific in that “artificial islands” are not counted as “territory” and have no effect on national boundaries.